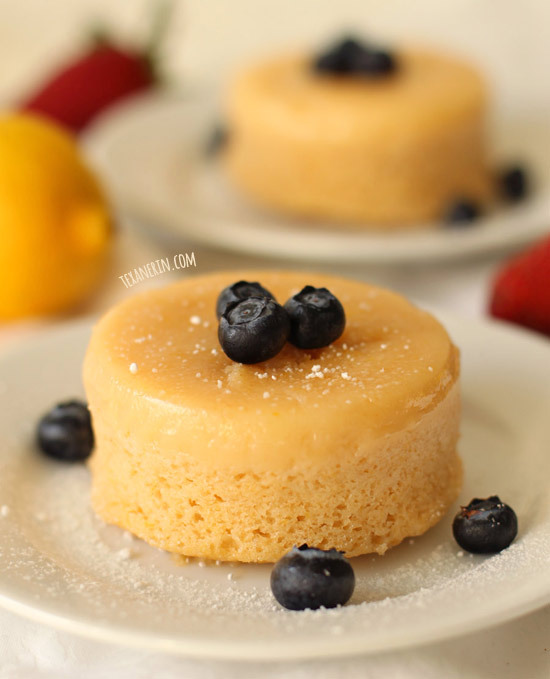 These whole grain lemon pudding cakes are the perfect Easter or spring dessert for two! You can easily double the recipe, if need be. Easter dinner at my place usually consists of just Mr. Texanerin and I, which means I don’t really have the opportunity or need to make a full-on carrot cake (because yes, carrot cake = Easter). You could make these gluten-free carrot cakes for two or you could try these lemon pudding cakes for two! Lemon is spring-y, right? 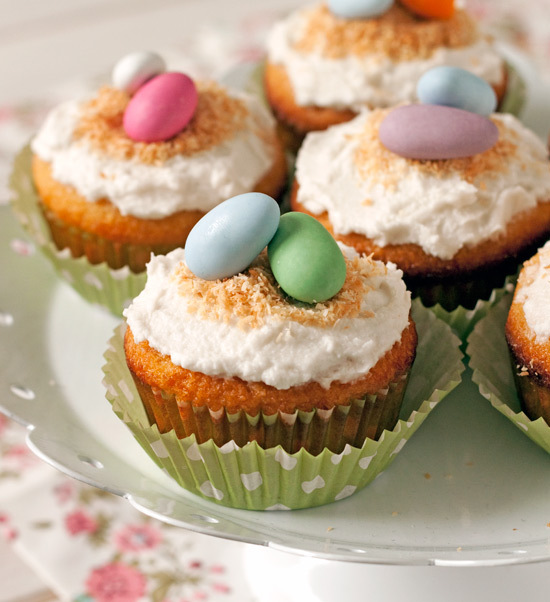 And these little cakes are pastel colored, lemony, and dainty. That just screams Easter to me! If you’re lucky enough to have guests over for Easter, then you can easily double the recipe and have lemon pudding cakes for four. They keep well refrigerated so you could also just save them for later if you don’t want to share with your guests. ;) That also means you can make these a few days in advance of serving. Pudding cakes are new to me. I was interested in them just because I thought there’d be pudding involved – but there’s not! You make one cake batter and during baking, it separates. On the bottom you’ve got a creamy, almost pudding-like sauce and on the top, you’ve got normal lemony cake. Prefer chocolate? Try this easy chocolate pudding cake! Pretty much the only time I use granulated sugar is with lemon baked goods and this was no exception! I don’t want anything interfering with the lemony taste and coconut sugar, honey, etc. would. I guess you could use a light colored unrefined sugar but I’d definitely grind it first in a coffee grinder so it’s a little finer. I reduced the sugar but didn’t reduce it by a ton because I wanted the cake and the “pudding” to actually separate. I also lightly dusted the cakes with powdered sugar but that was definitely unnecessary. 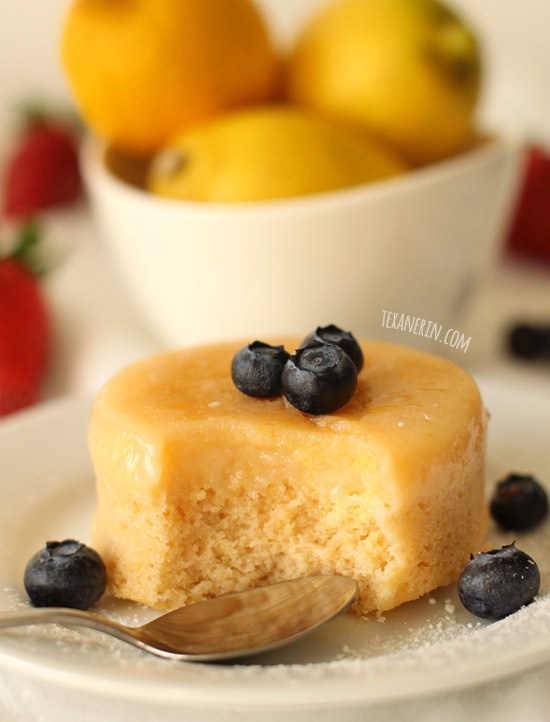 These lemon pudding cakes are sweet enough on their own! I added some blueberries just because I feel like lemon and berries are meant to be together and because it makes them look classier. ;) And if you have any imperfections in the pudding part after inverting the cakes onto their serving plates, berries will cover them up! There are only two tablespoons of flour in this recipe and although I haven’t tried it, I’m assuming that a gluten-free baking mix would work. But almond flour? Probably not. 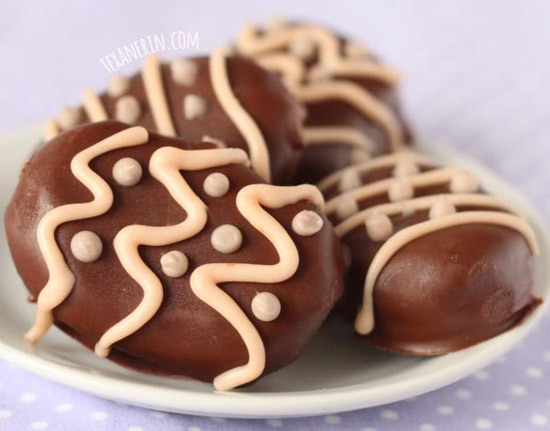 I will try to come up with a grain-free version of these, though! For another lemony treat, try these gluten-free lemon bars from Noshtastic! 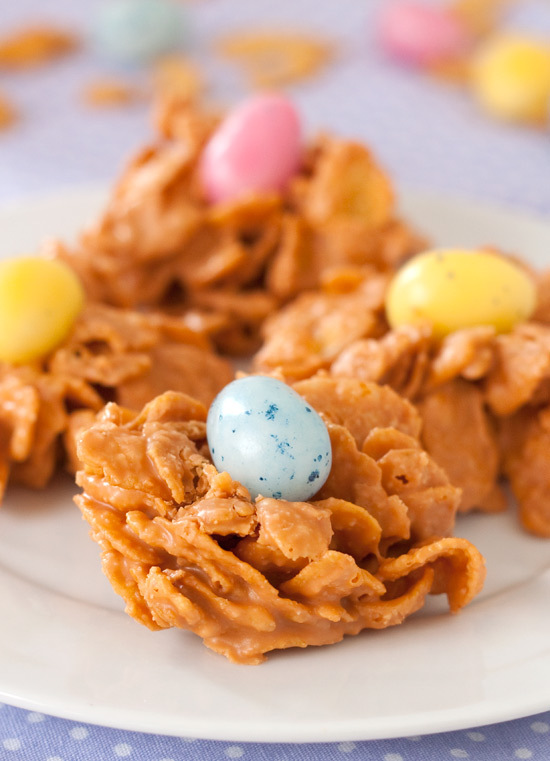 Looking for more Easter goodies? Here! Preheat the oven to 325°F (162°C) and butter and lightly sugar two 1-cup ramekins. In a small mixing bowl with a hand mixer, beat the egg white until you have stiff peaks. Set this aside. In a medium bowl using the same beaters, beat together the egg yolk, buttermilk, lemon juice, and lemon zest until thoroughly combined. Using a rubber spatula, fold in the flour, sugar and salt. Gently fold the egg whites into the liquid mixture a little at a time. Divide the batter between the two greased ramekins. Place the ramekins in a small roasting tray and fill the tray with water, just halfway up the sides of the ramekins. Bake for 25-30 minutes or until the tops of the cakes spring back when lightly pressed. Remove the cakes from the oven, cool for 5 minutes on a cooling rack, and then carefully invert the cakes onto their serving plates. Serve immediately or let them cool completely, refrigerate and serve cold. These keep well refrigerated for up to 3 days. Right before serving, garnish with berries, if desired. 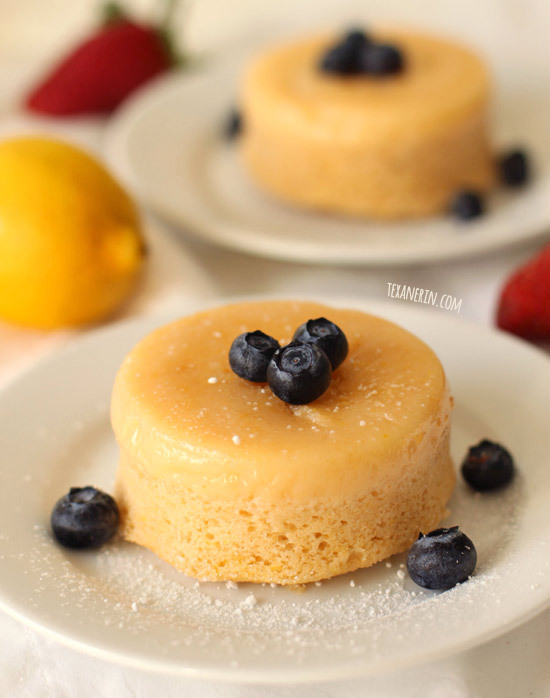 16 comments on “Lemon Pudding Cakes for Two (100% whole grain)” — Add one! Hi there! How much grams is 1/3 cup buttermilk and 1/4 cup granulated sugar, please? Thanks a lot! Hi Erin, Just wanted you to know I tried these last night and they were outta this world !!! I realized that I only had 4.5oz ramekins and so I made four instead of two and reduced bake time to 20 min. Also, I took your advice and used regular flour and it worked great !!! Love following you, and thank you again for all your great recipes !!! ;) PS Curious what makes the pudding and cake separate like that!? Ive never heard of a pudding cake before. I’m so happy that you like the recipes, Paige! Thank you. :) You could just use regular all-purpose flour if you don’t have whole wheat. Or do you need it to be gluten-free? If so, you can use a GF baking mix and if you don’t have that, oat flour might work. It’s such a small amount that I have hope! Good luck and I hope you’ll enjoy them! Oh wow, I have been here in a while and look at all of these grate goodies. I am pinning this to make soon. I love lemon and this looks pretty easy and so delicate and yummy. These are so pretty!! I love the recipe! Happy (early) Easter! What a sweet, lusciously lemon way to celebrate. Also, I’m not super familiar with pudding cake either. Thanks for changing that!